BAD wanted to ensure that the canning facility they would purchase would be not only efficient but also give the quality of canning associated with a much larger high speed canning line. This was especially important as their products have been launched nationwide in some of the multiple retailers/supermarkets focusing on craft beers. 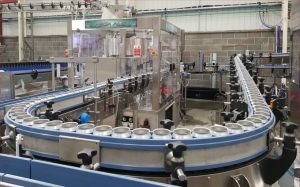 To achieve this a complete project from Enterprise Tondelli was selected for the can filler/seamer along with the canning line ancillaries including all conveyors. The can line starts with a high level all stainless steel can de-palletiser that can handle both short and tall stacks of cans for cost saving on bulk can transport costs. This feeds to a gravity can rinser with two channel for future can sizes such as 440 ml or 500ml and using the same design as high speed lines. Additionally an ecologically minded water conservation tank and filtration system was installed. In phase 2 it will be possible to run the two packaging facilities independently but without moving any of the equipment installed in phase 1 allowing sustainable and modular growth for the future. The can filler is a rotary design which gives superior control of the filling environment. Cans enter the machine and the filling valves lowers to seal the can. This is followed by flushing the can with CO2 to remove any air that will oxidise the beer. To reduce foaming or fobbing of the product and oxygen pick up, the can is pressurised again with CO2 and then filled with product. Once the product reaches the fill level the valve closes and the can is depressurised in a controlled manner to reduce product loss. A single head can seamer (manufactured by a specialist can seamer company for best results) is monobloced with the can filler. This includes under cover gassing to control oxygen pick up. These procedures preserve the product integrity, flavour and increase shelf life. Total in package oxygen was measured as less than 20 parts per billion during the production. As they plan to contract can BAD have a number of can seaming heads to meet customer needs such as 360 end etc which makes for a comfortable experience drinking direct from the can. Additional beer reception tanks and conditioning vessels have been added to allow a full service to would be contract canning or bottling customers. To further enhance the quality of canning an automatic level inspector/rejector from Enterprise was located after the seamer discharge. This ensures that all cans are checked for the fill level and then any cans out of specification are rejected. Only after the cans have been inspected do they travel to the can inverter and then drier tunnel before receiving an ink jet code guaranteeing the quality of production. Carbonation of the beer is done by a skid mounted bespoke unit from Enterprise that uses magnetic flow meter for the beer and mass flow meters to accurately dose the CO2 or N2. This is then followed by a serpentine pipework to ensure even mixing and then fed to a stabilisation tank. 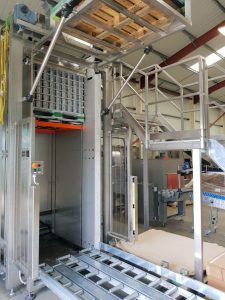 The assembly is mounted on a stainless steel skid complete with a control panel and flow plate to allow beer to be fed to bottling, canning or kegging as required. Additionally a nitrogenation facility is available. Secondary packaging is with trays and a shrink wrapper to manual palletising station. 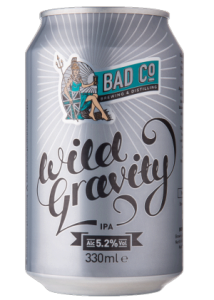 The full range of BAD beers are available in both cans and bottles from a wide variety of outlets – visit www.wearebad.co for their on-line shop or full list of outlets. Enterprise Tondelli believe that just because the beer is craft, it should still receive the same or better care and attention as high speed canning. 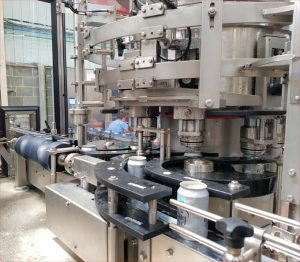 We supply an entry level 8 head can filler with a single head seamer rated at 3,500 cans per hour x 33 cl featuring static can and moving valve technologies up to 80,000 cans per hour with flow meter technology. Enterprise Tondelli can supply just the can filler/seamer or a complete canning line. 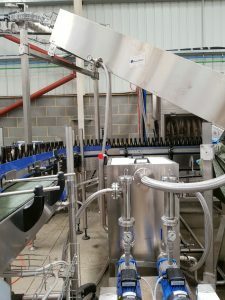 We also supply bottle filling lines and keg filling lines too along with brew houses ….. So who can? BAD Co. can! 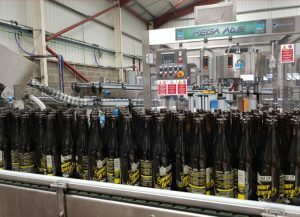 Further details and case studies of other canning lines, bottling, kegging and brewery installations can be found at www.enterprisetondelli.co.uk or call 0044 1525 718288.